If you’re a new fan or you just want an 8 minute recap of the previous three seasons of BSG, watch the vid on the Sci-Fi channel. The best part is the deadpan delivery with some jokes. I wish I could embed it, but click, watch, and listen. 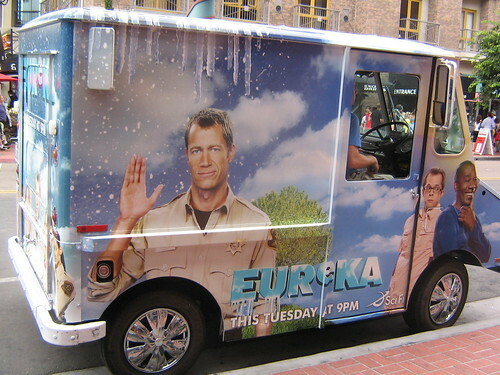 Speaking of jonesing for some sci-fi programming, Eureka‘s most likely going to air in the summer for a third season. Just don’t tell me to satisfy my withdrawal symptoms with Lost. In last night’s episode, there’s an exploding toilet. Sewers are also featured in “Maneater,” but it’s safe to say they’re not used as a means of escape or to get from point A to B. Eureka‘s not that obvious, but the sewers* do play an important role in solving the mystery of the week. A few episodes, Carter met Callie, the invisibility chemist turned dry cleaner, and it was nice to see him move on from Allison. However, Carter soon finds himself to be irresistible to all the women in Eureka, including Jo, Allison, and the presenter of the sexual harassment workshop at the beginning of the episode. Every man dreams of being the sexiest man in town, but this soon turns into a life threatening situation for Carter. Of course, you can expect a scientific solution, but I’m not giving this one away. Eureka is definitely climbing up there with all the Star Trek episodes for interesting science for problems and magical solutions, but their approach is much more subtle. Stark looked hot and irresistible in his form fitting short sleeve black shirt. Apparently, he’s been reinstated as a researcher at Global, unless he has no life and hangs out there. He certainly isn’t in a hurry to get a job elsewhere. While some previous episodes cast some doubts on his villainy, this one raises some questions. Perhaps it relates to the mysterious agenda at the end of “Once In A Lifetime,” but he’s not too crazy about Carter snooping around about Kim’s death (which was caused by an experiment with the Artifact). *waste and air conditioning, which requires an MIT PhD to manage. This week, I saw Eureka live on the Sci Fi Channel like the rest of the mortals. No sneak peak here. Exploitative parents, high school has-beens, and mean girls in Eureka? Strangely enough, yes to all of the above. A not so ordinary science fair seems to bring out the worst in some students, a parent, and the anxieties of a science fair winner from the past. As usual, Carter gets drawn into the case due to some quirky circumstances. A funny moment is when Carter goes to the gym to impress Allison. The local gym, like most places in Eureka, is high tech. Carter grappling with some odd technology of the week is one thing, but since he isnt a gym bunny, his workout clothes are on loan from the gym: a tank top with RELAX across the chest and black and white vertical striped shorts. This has got to be some kind of 80s fashion joke from Wardrobe. As for Nathan Stark, he does work out (and thats something that was evident at Comic-Con). After the gym visit, an incident caused by irresponsible parenting draws Carter into the case of the shooting stars. Despite his clumsy fathering moments, its safe to say hes not the culprit. However, someones child rearing skills is suspect, and its taken to a high tech level. In Eureka, the mean girls are smart. In a town where most adults are highly intelligent and their children are infinitely smarter, these girls are super geniuses. Needless to say, theyre not nice about it, especially to Zoe. This episode, though, reveals some nice surprises for Zoe in how she measures up. Many towns are littered with former star high school football players, but Eurekas full of former science fair winners. As shown in previous episodes, science fair alums, like anyone else in Eureka, are capable of a lot of damage. There arent any former high school Wii baseball players (see Blink for the ball game) who are out to run away from or reclaim their high tech fame. Then again, virtual sports players dont serve this story, but the parallels to juvenile athletic glory are there (or spelling bee winners). Much of the technology in Eureka so far has been reminiscent of something shown on Star Trek, but its nice to see that theyve gotten more inventive in this episode. The gym technology is one thing, but device responsible for freak incident of the week is quite another. Im not giving it away. Youre just going to have to watch and find out. Maybe next week, we’ll get to see some Carter skin. That’s what the trailer implies, anway. Stay tuned this Friday for Flash Gordon on the Sci Fi Channel, 9pm local time.